Heat oven to 425°F. Unroll pie crusts on work surface. Using 2 1/2-inch cookie cutters, cut 15 pastry shapes out of each crust. Reroll scraps and cut an additional 9 shapes. Place on ungreased cookie sheets. Prick each piece of dough with fork, sprinkle with coarse sugar. Bake about 7 minutes or until light golden brown. Immediately remove from pan to cooling rack. Cool completely, about 20 minutes. Meanwhile, in medium bowl, mix whipped topping and yogurt until blended. Divide evenly among 3 small bowls (about 1 cup each). Cut banana into 18 slices. Mash 5 of the slices. Stir mashed bananas into one-third of the whipped topping mixture. Spoon mixture into resealable quart-size food-storage plastic bag. Cut 1/2-inch opening in corner. Squeeze mixture onto 13 of the pastry pieces. Top each with 1 banana slice. Mash or finely chop 2 of the strawberries, to get about 2 tablespoons mashed strawberries. Stir into one-third of the whipped topping mixture. Spoon mixture into resealable quart-size food-storage plastic bag. Cut 1/2-inch opening in corner. Squeeze mixture onto 13 pastry pieces. Slice remaining strawberries into 1/4-inch slices. Top each with strawberry slice. In small microwavable bowl, melt chocolate chips uncovered on High 1 minute, stirring until melted; cool slightly. Spoon 2 tablespoons of the chocolate into medium bowl; gently fold in remaining one-third of the whipped topping. Spoon mixture into resealable quart-size food-storage plastic bag. Cut 1/2-inch opening in corner. Squeeze mixture onto 13 pastry pieces. Place remaining melted chocolate in small resealable food-storage plastic bag. Cut small hole in corner. Drizzle chocolate over each pastry. 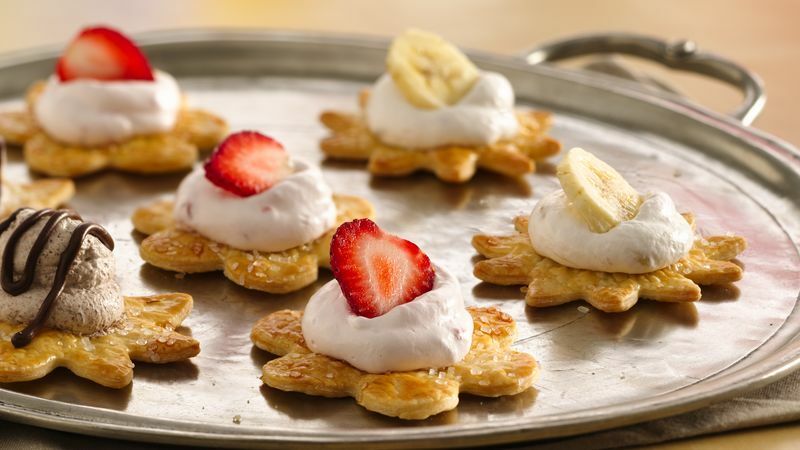 Pastry pieces and toppings can be made ahead; assemble up to 30 minutes before serving. Don't have the right sized cutter? Cut shapes out of cooking parchment paper, and use it as a pattern.